Some people love spending holidays with their families. For others, there's Family Therapy. This cocktail is wickedly strong--it contains nothing other than liquor. It's also really good, so be careful with it, since you might be tempted to down it pretty quickly. Or maybe that's the point. 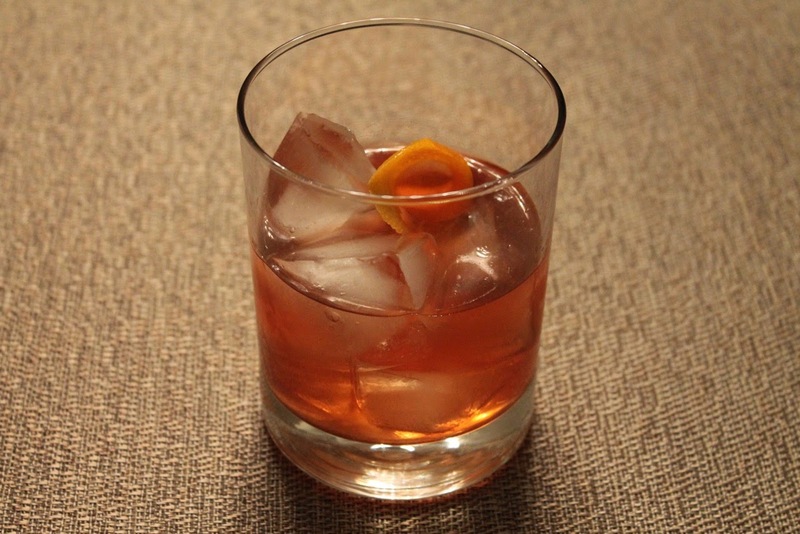 The drink originated on My Poor Liver Podcast's Thanksgiving episode as their Cocktail of the Week. Neil and Eddie remarked that Family Therapy is basically an Old Fashioned that tastes like Thanksgiving given its mix of ginger, orange and cranberry. Sounds divine, doesn't it? I knew I had to try it. The recipe below is a slight modification of Neil's original. He mixed 2 oz. of bourbon modified with 1/4 oz. each of ginger liqueur, orange liqueur and Cherry Heering, a distinctive Danish cherry liqueur. I thought I had Cherry Heering in my liquor cabinet, but I was wrong, so I needed to make a substitution. I considered Cherry Kijafa, a Danish fruit wine fortified with brandy, but I didn't like the flavor. I also had Kirschwasser, the cherry brandy best known as a fondue ingredient, but as a brandy, it wasn't sweet enough. I settled on maraschino liqueur, which has a wonderful cherry flavor and sweetness. Because it's a pretty strong flavor, I cut the amount in half to 3/4 tsp. (about 1/8 oz.) to avoid overpowering the other ingredients. For the ginger liqueur, they used a local (to Portland, Ore.) ginger liqueur from New Deal Distillery, although they stated that the nationally distributed Domain de Canton ginger liqueur would work, I also wanted to use something local, so I turned to Bloomery Sweetshine ginger liqueur, which is made in West Virginia. This has a more intense ginger flavor than the Domaine de Canton, although this didn't stop me from doubling the amount of ginger liqueur, a personal preference. While this drink lack's Neil's nice simplicity of the 1/4 + 1/4 + 1/4 ounce measurements, it's still quite tasty. All this month, the My Poor Liver guys are talking about the holidays, and I love how they really get into the holiday spirit on their show. They've already shared some wonderful seasonal drinks. Last week's show included a discussion on good hot buttered rum, and this week they got pretty merry with some awesome sounding champagne cocktails, a classic I've yet to try making. Check out their podcast here. Combine bourbon, liqueurs and bitters in a rocks glass with ice. Stir until very cold and garnish with the orange peel. Thanks Neil! I'm always happy to talk up your podcast. You guys are doing a really great job with it. I've learned a lot, and I always have a good laugh too.